Just in time for St. Patrick's Day, a recipe with Irish roots! 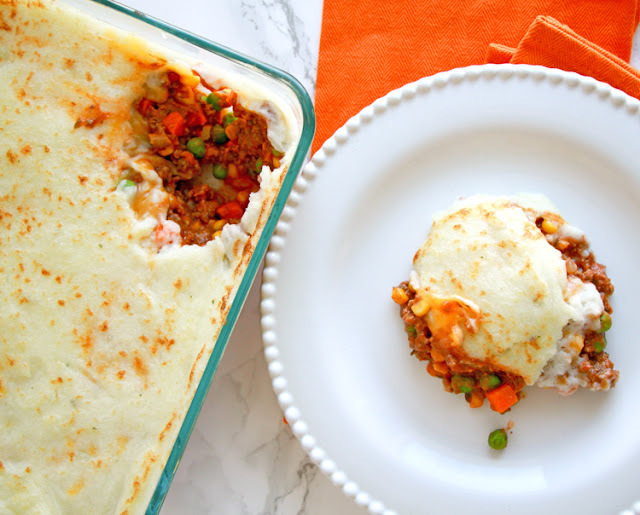 We grew up eating Shepherd's Pie, but I haven't always been a fan of this dish. It was one of 2 meals my dad prepared on a whim when he was in charge of dinner (the other meal being spaghetti). I don't know if it was the can of Veg-all or the half a bottle of ketchup he added to his concoction that turned me off, but I always assumed all Shepherd's Pie was created equal and I didn't eat it for many years after I left home. On my honeymoon, Adam and I ate at an Irish pub and he ordered Shepherd's pie. It had the same initial appearance as the stuff I grew up with, but it smelled so different. 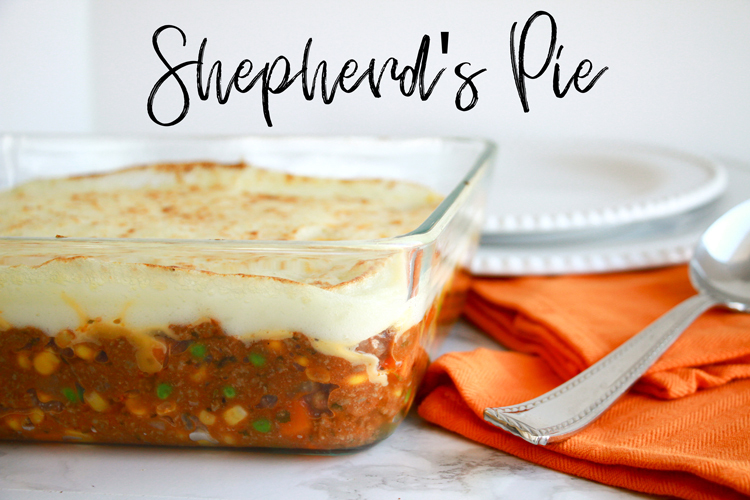 I hesitantly took a bite and much to my surprise, all shepherd's pies are NOT created equal! This was amazing, so flavorful, so comforting! So, after a 7 year hiatus, I started eating it again. It's one of those meals that I am usually able to throw together without much planning. I usually have the frozen veggies, meat, broth, and spices on hand. When I end up with extra potatoes, this is often the dinner I make to use them up. It's also a great meal to make if you are bringing food to someone. It's easy to double and can feed a crowd if you need to. 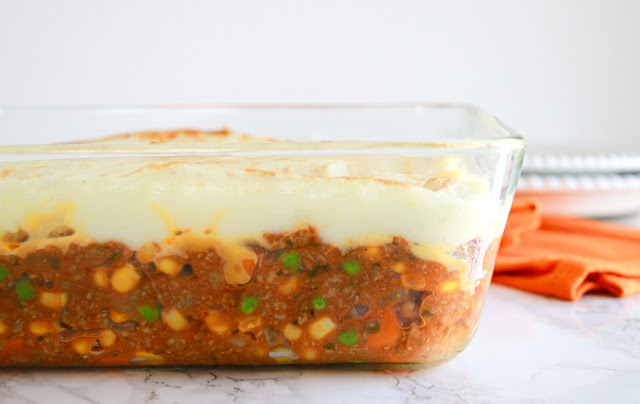 If you also grew up with the Veg-all/ketchup based Shepherd's Pie, do me a favor and give it another chance. This recipe will change your mind and give you a new meal in your rotation! In a large skillet, add the ground beef and onion, cook until meat is brown and onion is translucent, then drain any remaining fat. Add seasoning salt, parsley, thyme, and garlic then cook another minute until garlic is fragrant. Sprinkle flour over meat mixture and stir to combine. Add wine, beef broth and tomato sauce, stirring to mix well. Use caution if pouring alcohol over an open flame. Add the bag of mixed veggies then let the mixture simmer until thickened, about 10 minutes. Boil the potatoes until soft. Using a hand mixer, combine potatoes, butter, milk and garlic salt, mixing well until smooth. I should have measured the milk for you, but I didn't. Sorry! It's just one of those things I wing every single time. Add a little milk, mix, add a little more milk, mix some more...and so on until you get the consistency you like. In a greased casserole dish, layer the meat mixture, then the cheese, and finally spread the mashed potatoes evenly over the top. Bake at 350° for 30 minutes or until bubbly and the potatoes start to brown. You can make this a day or two in advance and refrigerate until you are ready to cook it. So tell me, have you always been a Shepherd's Pie lover? What's your favorite Irish-y meal?